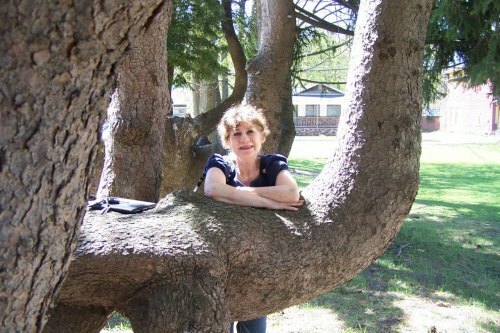 Shelly Reuben’s illustrated urban fable, which was recently serialized in HuntingtonNews.Net, will be published as a book for the first time on April 27 – Arbor Day. It is available to readers in all formats (digital and paper) wherever books are sold. 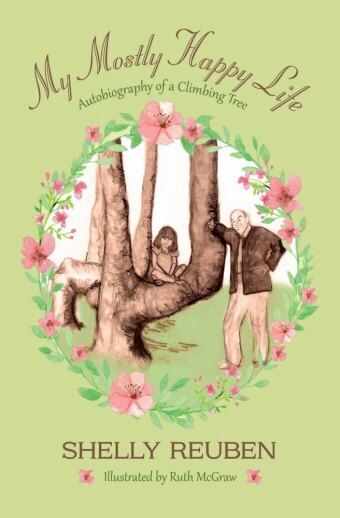 Shelly Reuben’s new novel, My Mostly Happy Life: Autobiography of a Climbing Tree, is a unique blend of fantasy and realism that captures your attention right up to its climactic chapter. Narrated by one of the climbing trees in a very special park enjoyed by generations of children, families, couples, nature lovers, and animals, the book sustains a true “feel good” tone until the very existence of the trees is threatened. The threat is very real as is the villain of the novel – a sly punk kid who naturally grew up to become a sly punk politician. Adding to the enjoyment of the novel are illustrations by Ruth McGraw which bring the main characters and their park to life. In her latest novel, Reuben, Edgar nominated for her arson and crime mysteries, proves that her transition to fantasy with her last work, The Man with the Glass Heart, was no fluke. As the tree narrator relates, Samuel Swerling, a World War II veteran, wealthy inventor, and tree lover, buys two acres of land in a large city and commissions Alonso Hannah, a one-armed landscaper, to convert them into a private park that would be filled with trees trained to grow in such a way that children could easily climb them. The park became a happy place where people fell in love; painters painted pictures; pretty girls basked in the sun; and time stood still. Most of all, though, it was a place where children could do what the park had been designed for them to do: climb trees. Over the years, we get to know Swerling’s children and grandchildren who preserve the park for the city and its citizens. The novel also introduces us to two special pets – Pal, a Cockatiel, and Winston, a ferret. When a hurricane floods the area, Esther, Samuel Swerling’s granddaughter, and her family provide food and shelter for those seeking refuge from the storm in the park. But not everyone is grateful for the park and its trees. Jarvis Larchmont, whom Sam threw out of the park when he was a bullying twelve-year-old boy, has now emerged as a local politician, and put in charge of all the city’s recreational facilities. He joins forces with Eco-terrorists, and in the guise of protecting the trees by preventing anyone from climbing on them, puts them in dire peril as the weakening narrator relates. How Esther and her friends fight back and thwart him is described in the concluding chapters culminating in chapter that should bring tears to anyone’s eyes as it did to this aging male who regretfully never climbed a tree.